Take for example Noftle’s poem, “Mating Chain,” where she exorcisizes the bizarre mating sexual excursions of sea slugs and explores how this references, “human sexuality and nature vs. the ‘rules’ of romantic relationships”. Here, personal connection is mirrored in a “polyamorous experience,” and we are given opportunity to question intimacy, gender, and our more savage “animalistic instinct”. How does sleep and dream effect these deliberations? We face scapes of multiplicity, fear, and risk, present in the larger scope of her work. Noftle’s musical method evokes a more organic, “messy” quality that inspires chance and less linear examination. Kelli Anne Noftle grew up in a small town in central Virginia. She has a B.A. in Visual Art and is a graduate of the Master of Professional Writing Program at the University of Southern California. Her work has appeared in several literary journals including Colorado Review, The Journal, VERSE, Blackbird, Cream City Review, Conduit, and Harvard Summer Review among others. 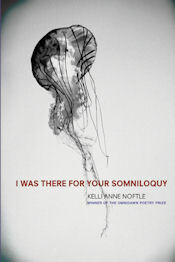 Her first collection of poems, I Was There For Your Somniloquy, was selected by Pulitzer Prize winner Rae Armantrout for the OMNIDAWN BOOK PRIZE and is forthcoming in 2012. I saw the movie Poltergeist when I was four (way too young!) and started writing short stories about death and the supernatural. Consequently, I’m quite afraid of the dark even as an adult and themes of loss and fear are still very prominent in my work. It wasn’t until my parents’ divorce that I started writing poems. I was extremely prolific as a teenager; I wrote a poem every night before bed in high school. Allen Ginsberg’s Howl was the first collection of poems I bought when I was fifteen. Today, my favorite poets/writers are Christian Hawkey, Mary Ruefle, Lyn Hejinian, Jorge Luis Borges, Angela Carter, Christian Bök, Roberto Bolaño, Jennifer Egan, and Gertrude Stein. The first poetry course I took was in graduate school with the exceptionally talented and brilliant Elena Karina Byrne. Elena mentored me, introducing me to contemporary poetry as well as the Los Angeles literary community. My fiction professor, Shelly Lowenkopf, is also a dear friend. I am indebted to their support and encouragement. I learned to stop editing myself in the creative process. When I write, I tend to disappear, which seems essential to art-making. In those moments, imagery informs the language. It’s all about listening to that inner voice and getting lost following a trail of obsessions down the internet’s rabbit hole no matter how bizarre or unrelated the material may seem at the time. I’m usually pleasantly surprised by odd little connections the brain makes—what may seem like a non sequitur can become the driving force of the poem, a conceit that tethers it all together. Overall, I trust myself more as an artist/writer than I did when I first began. Reading contemporary poetry has changed my work too. 4.) What are your plans for the future? To write a novel and produce/record another album using my laptop. 5.) Who are promising women writers to look at in the future? 6.) If you were asked to create a flexible label of yourself as a writer, what would it be? 7.) The balance achieved between music and lyric must be uniquely balanced. Structure performs in distinct and similar roles in both song and poetry. Some argue the composition of the lyric in a song requires more precise articulated poignancy to deliver a message to the listener when digested in balance with the music that it is accompanied with. Just as there are different structures in poetry, we have the same in music. The possibilities of these unions address the promise of diversity in structure and aesthetic. How do you approach this complexity? Can you please elaborate on your methods of songwriting and poetry and how they aid, differ, attract the listener in different ways? Do you find that some structures are more apt to invite/alienate the reader/listener? My song-writing brain gives my poetry brain a rest when composing music. I can’t say I’m “composing” because it feels sloppier than that, a very organic process that is heavily reliant on instinct and guessing. Unlike poetry that requires a great deal of editing after the primary creative burst, song-writing (for me) has a lot to do with luck. My songs range from the conventional verse-chorus-verse-bridge-chorus structure to a more experimental soundscape. It’s sometimes difficult to play with other musicians because they will tell me to “play the verse again,” and I’ll play the chorus instead because we have different perceptions of song structure. When writing lyrics, occasionally I borrow a line from a poem, but I tend to choose language I wouldn’t use in my poetry. For example, in one of my songs I’m just chanting the phrase “I DON’T LIKE YOU” repeatedly and it’s my favorite song I’ve ever written . (www.miniaturesoap.bandcamp.com) People seem to enjoy it more than others too. I love listening to pop music. I’m okay with lyrics that are completely banal and cliché. Britney Spears and Rihanna? Yes, please. Sitting in LA traffic makes me crave catchy hooks and fast beats. 8.) Your poem, “Mating Chain,” begins with a description of the mating ritual of snails: “When three or more sea slugs mate in unison, the first animal in the chain acts exclusively as female, the last as male, and the others as male/female simultaneously.” The poem leaves us with, “But what’s the difference between this hunger and parasitic tendency? I twist and steer each tentacle, tying knots against the stillness. This one to symbolize love and the other, savagery. I’m learning the subtlety, braiding between them.” I am interested in the “subtlety” of gender/love/connection with one to “other” perhaps even these feelings within the self that you seem to address here. How does this relate to the body’s repetition in loneliness? Are you suggesting a tension between the actions of a body and their relationship to the savagery of the process or the connection to the mind? Where in your opinion does love lie in these subtleties? This poem is one in a series about sea slugs (Nudibranchs). The poems evolved after attending a marine biologist’s lecture on the mating habits of sea slugs. I’d fallen in love with two people at the same time that summer. It was thrilling and unexpected and messy. One of the people I was in love with became involved with someone else too, so it was this complicated, hopeless situation where I think everyone got hurt eventually. The presentation on Nudibranchs made me question human sexuality and nature vs. the “rules” of romantic relationships. I fantasized about being a Nudibranch engaged in a mating chain where the individuals involved could replace emotional connection with animalistic instinct and swap genders at will. I imagined it to be seamless. This polyamorous experience contrasted with the image of a lone Nudibranch presented in that same lecture—a sea slug that can only move by folding itself in half and reopening over and over as if hinged in the middle, like a snapping jaw or flapping wing. There was a video of it propelling itself upward into the currents, a repetitive motion of opening and closing against a backdrop of dark interminable sea. I identified with that creature, thinking that’s me— wanting desperately to relate to or connect with the “other,” but finding myself alone, working feverishly just to move forward. This is basic self-preservation but it looks terribly forlorn. We have more in common with a species as foreign as the sea slug than I’d ever imagined possible. There’s a Jenny Holzer quote I love that says, “Having two or three people in love with you is like money in the bank.” To which I would have to respond with a quote by Biggie Smalls: “mo money, mo problems.” I think some of my loneliest moments in life were spent when I was in a romantic relationship (or relationships). Savagery becomes necessary. At the end of the poem, I’m working to reconcile the two by braiding them together—realizing the difference between desire (hunger) and co-dependency (parasitic behavior) is only very subtle. How does love fit in exactly? I’m still trying to figure that out. Maybe the poem is about a struggle to find that balance. 9.) In the introduction to your poem “I Follow You All Through the House with My Ears,” published in The Nepotist, you admit that sleep should be safe, prompting us to identify the alternative. The passage I am most interested in reads, “It is inevitable what language will do.// Do not repeat this, what I’m about to say—/Your hands will circle the kitchen/sink, making it clean.” The poem speaks to enveloping that in our dreams which we do not in our “awake” lives. Language here is able to traverse in both realms. This challenges our perceptions of real, our ability to perceive and communicate what are synapse register in a perceived grid of light. The limits of language’s fragility embraced in the miscellany of experience. I am attracted to the last phrase “make it clean”. The poem instructs, “do not repeat” “making it clean”. Do not make it clean. What in your opinion is clean and how does this relate to the conscious and subconscious nature of dreams? Sleep is dangerous. In evolutionary terms, if you look at the development of terrestrial mammals, sleeping with both eyes shut is a curious adaptation. Most reptiles, marine life, and birds sleep with half of their brain fully conscious while the other half rests – one eye is always open, on guard for potential predators. Some scientists theorize there are still active circuits in our reptile brain, alerting us to the risk of being harmed or killed as we sleep. This split brain behavior is evident in sleepwalkers and those who suffer from parasomnias/sleep disorders. Years ago, I was in a relationship with a man who engaged in multiple parasomnias –sleep walking/ talking/eating, sexsomnia, night terrors, and bruxism. I found him eating my ice cream in the middle of the night, but he had no recollection of it the following morning. I researched case studies of somnambulists who inflicted pain upon their loved ones and partners because they were enacting dreams of being physically threatened by an imaginary predator. The speaker in this poem witnesses violence, but also partakes in it. Ambiguity in the voice emerges from the negotiation between a conscious and a subconscious place and bodily actions are dictated from a divided brain. Language is slippery and filled with holes, so sleep-talking (the somniloquy) further reveals its fragility. “Making it clean” can be seen as the act of erasing, trying to remove the inherent flaws of language, an impossible task. Someone told me you can fall into bad habits if you use white consistently. It’s an analgesic. When you want to lighten the sky, you dab the zinc into your blue. When you want to push a little pathway across the thicket, you blot ivory into your Payne’s Grey. It saves time. That’s why I started dumping all my pigments into a bucket of white. It was mostly just to save time. I am interested in this poem both because of your commentary and experience with studio art specifically in the medium of paint, as well as our cultural adhesion to the color white, and our western cultural perception of light. In this poem, white saves time. What then is color? A fellow painter once advised me not to use white or black paint when mixing color. This was to preserve the intensity of color because tinting or shading a hue takes away from its particular vibrancy on canvas. Mixing primary and secondary colors to get the desired shade is more difficult than adding white and it requires skill, experience. White (often associated with religious purity and innocence) would actually diminish and dilute the “purity” of color on canvas. It’s an interesting concept; I had not consciously considered the western cultural values/perception of this color when writing this poem. This is part of a series of epistolary poems addressed to an artist who challenges the speaker. An artist who is not afraid to make mistakes and risk loss. Again, here is a relationship where fear plays a large role in the dynamic.